Augusta O. Childs, an orange grower and contractor, built this fine Victorian residence in 1896 at what was then an unnumbered address on West Palm. 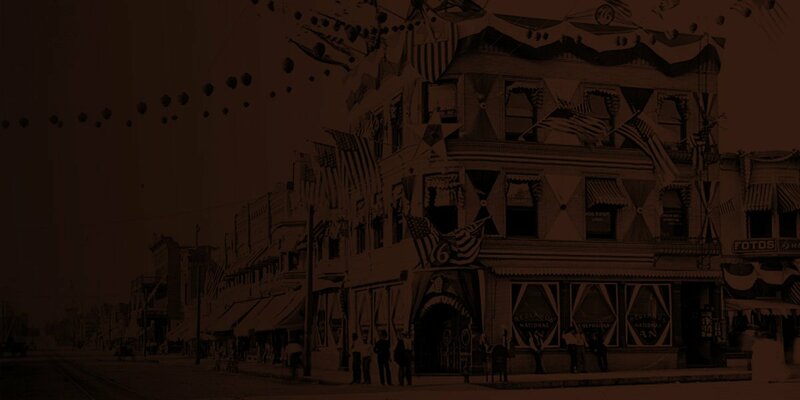 When postal home delivery was inaugurated in Redlands in 1897 the address became 229 W. Palm. Childs kept the house for less than a year and sold to Charles A. Hale, a civil engineer. Hale was asked to participate in fact-finding for the Crafton Water Co. vs. Barton Land and Water Company case in 1903. His testimony helped the Crafton Water Company win the case. His wife was the daughter of Cassius M. Hall, a Redlands grocery pioneer. Hale sold the house to Anna P. Kitching in 1904. Anna Kitching’s father came to Redlands in 1888 and made his fortune in land and water development. Kitching was a board member of the Allesandro Development Company, Bear Valley Irrigation Company and South Mountain Water Company and manager of the Redlands Heights Water Company. Kitching Peak was named for Ammon P. Kitching, which is in San Gorgonio Pass near the Whitewater River. Frank Brown, co-founder of Redlands, gave the peak its name because of the many trips Kitching and Brown made to this water source. Kitching sold the house to William Medland, another Redlands pioneer, in 1909. William Medland came to Lugonia on Oct. 4, 1887. He came for health reasons from Canada and became the Bear Valley Water Company receiver during its bankruptcy problems from 1893 to 1903. Medland was superintendent of the Redlands Domestic Water Company for more than a decade. Medland and Kitching knew each other well because they were both involved in water development with Frank Brown. Medland was a charter member of the Redlands Elks before moving to Honolulu in 1937. R. Quincy Brown purchased the house in 1924. He was born in Connecticut in 1870 and came to Lugonia as a 12-year-old in 1882. His brother, Philo Brown, ran the Lugonia post office and store for Frank Brown. R. Quincy Brown recalled the first school in Redlands on West Palm in the 400 block very close to where the 429 residence stands today. He worked for the Worthing and Vining livery and later J. C. Reeves livery before getting a job with J.J. Suess Star Grocery. His first home was 244 Eureka St. He later owned the store at Citrus and Church Street. Brown lived in the house until his death in 1956. At the time of his death, he was the oldest pioneer of Redlands still living. A flurry of owners followed the three-decade ownership of Brown. Redlands Building and Safety lists Billy Woodring (1960), Joe Littlepage (1963), T.N. Garcia (1979) and Jonathan and Michelle Baty (1996). Improvements for the past three decades include the Garcia 85-foot-long brick wall, the Littepage garage and new foundation walls completed by the Batys. 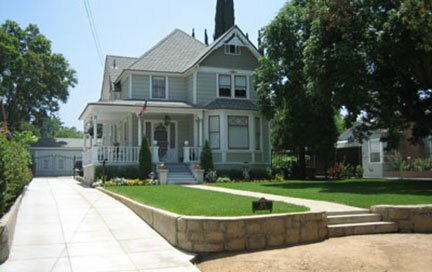 This two-story 1896 Victorian is roofed with fish-scale asphalt shingles. The front gable is decorated with shingle siding inside the gable and a cut wood pendant at the top of the gable. Single brackets project from each side of the second-story gable. The first story has an angular bay window. Plane Doric columns adorn the front and side porch. A red-brick fireplace is on the west side of the home. Four neighbors share an ashlar-cut rock wall along the street front, which curves with the driveway entrance. The earthen pathway on West Palm is planted with three oak trees. Returning the residence to the grandeur of the 1890s is the work of Jack and Susan Richter. The Redlands Area Historical Society appreciates their contribution and stewardship.